Bring on the cold weather!! Not yet tried by Dipsophilia, this is sure to warm the tummy! It's easy to make and brings out the underlying flavors of Tanqueray London Dry Gin. 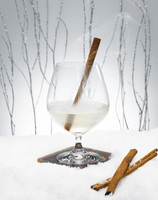 The Gin Toddy is perfect for sitting by the fire or as an after dinner sipper. 1. Pour the ingredients into a wine goblet.